The all-new Kia Optima, now in its fourth generation, will go on sale across Europe in Q4 2015 and early 2016 in the UK. Unveiled in European specification for the first time at the 2015 Frankfurt International Motor Show, the upgraded Optima boasts a modern, new exterior, a bold interior design with more space for all occupants, an array of new technologies and a wide choice of efficient powertrains. The new model will offer greater refinement and improved ride and handling over the outgoing model, while retaining the sporty image that has helped Optima become one of Kia’s best-selling models worldwide. The Kia Optima plays an important role in the product line-up, introducing the brand to an increasing number of new customers. Since the third-generation model launched in 2011, with its distinctive look, high quality interior and high-tech image, the Optima has offered buyers something fresh and different in the D-segment. The exterior styling of the all-new Kia Optima was a question of balance for Kia’s global design teams. The all-new Optima maintains the athletic identity that made it so popular, while making a confident leap forward to attract car buyers looking for something different. Conceived under the watchful eye of Peter Schreyer, President and Chief Design Officer of Kia Motors, the all-new Optima offers more road presence than ever, with its contemporary surface detailing, sharp body lines and creases, and a more elongated saloon silhouette. The all-new Optima’s evolutionary new look was designed to be functional and sporty, with exterior dimensions that are marginally longer, taller and wider. The wheelbase has been extended by 10 mm to 2,805 mm, with the full vehicle length growing 10 mm to 4,855 mm. Meanwhile the new model is 25 mm wider, at 1,860 mm, and 10 mm taller (1,465 mm). These changes enable a roomier and more comfortable cabin, with more head-, shoulder- and rear-seat leg-room and greater cargo capacity. From a styling perspective, the new dimensions afforded Kia’s designers the chance to introduce a more swept-back, dynamic shape. Instantly recognisable as a Kia, the all-new Optima integrates the brand’s hallmark ‘tiger-nose’ grille with the longer, wider, wrap-around headlamps, pulled taut over the blistered wheel arches. The bumper swells into bold right angles around the front fog lamps, adding greater volume to the lower part of the ‘face’ and giving the car a more stable, wider look. In profile, the glass area maintains the raked A-pillar and sweeping C-pillar that define the Optima’s sports-saloon appearance, with the rear quarterlight kicking up smartly as the shoulder line extends towards the raised boot lid. The shoulder line itself is an extension of the parallel followed by the front headlamps, forming a clean, straight light that connects front and rear. The deeply-sculptured body panels of the doors curve fluently into slightly extended side sills, again increasing the visual weight around the skirt of the Optima. The LED halo-style tail lamps wrap around the corners of the rear of the all-new Optima, and give the car a modern, new light signature. The athletic appearance of the car is boosted by a rising, spoiler-shaped boot lid and an expansive rear bumper which houses a sporty-looking air diffuser and oval exhaust. This attractive new design makes the fourth-generation model the most aerodynamic Optima to date, with drag reduced from 0.3 to 0.29 Cd. The all-new Optima will be available in Europe in a choice of nine paint colours, and will ride on alloy wheels ranging from 16- to 18-inches in diameter. The all-new Kia Optima range will be developed further in future, with the addition of a new body style, inspired by the Kia SPORTSPACE concept car shown at the 2015 Geneva International Motor Show. Drawing inspiration from Kia’s global range of models, the all-new Optima boasts a more luxurious, driver-focused interior than ever before, with features and technologies typically associated with the class above. The new cabin is crafted with an obsessive attention to detail, and represents the biggest step forward for the new model. Kia’s design team focused on delivering a thoroughly modern interior look and feel, with the cabin offering a cleaner, more unified design than the previous generation. The dashboard is spread along a more horizontal plane and a wider central console, creating a greater sense of spaciousness. The material quality of the all-new Optima’s cabin is significantly improved over the outgoing model, with a far higher proportion of soft-touch materials, as well as cloth and leather trim in natural tones. Tasteful metallic accents throughout the cabin add a higher quality ambience to the interior, while greater application of soundproofing ensures refinement is better than ever. The console is finished in gloss black, with a dash of chrome running the length of the dashboard, dividing the display and control zones and lending the interior to single or two-tone colour schemes. In reshaping the front and rear seats, the interior design team also paid particular attention to seat comfort. Stiffer seat frames reduce the level of vibrations through the seats while improving seat durability and reducing the weight of each seat by 2.6 kg, while softer foam in the headrests, upper back and under-thigh supports allows occupants to nestle into the seats more comfortably. In the front, deeper side bolsters are made up of denser, more supportive foam. Rear passengers also get their own heater, while pull-up sun shades built into the rear door trim. Cargo space in the all-new Optima has grown from 505 to 510 litres (VDA), with the under-floor storage area and a wider boot opening adding greater practicality. The all-new Optima features a uniquely engineered body which combines more high-strength materials than ever before, resulting in even higher standards of crash safety. While passive safety is improved, the new model is also equipped with a series of high-tech active and autonomous safety features, and Kia’s engineers have targeted a five-star Euro NCAP safety rating throughout the Optima’s development programme. The bodyshell of the all-new Optima is stronger than ever thanks to the more extensive use of Advanced High-Strength Steel (AHSS). 50 per cent of the body is now made up of AHSS – representing a 150 per cent increase over that of the previous car (20 per cent) – and boasts a 450 per cent increase in the amount of structural adhesive used. The result is that torsional rigidity has been improved by 50 per cent over the model that it replaces, while the body shell is also 8.6 kg lighter. The higher-strength steel alloys have been applied to reinforce the A and B-pillars, side sills, roof, floor, front wheel arches and rear bulkhead, boosting the all-round structural integrity of the body. Passive safety is further improved for occupants with the total number of airbags increasing to seven. The all-new Optima will be fitted as standard with driver, driver knee, passenger, two front side and two curtain airbags. The all-new Optima will be a strong performer in global safety tests thanks to its suite of new technologies designed to avoid or mitigate the effects of a collision. The all-new Kia Optima’s AEB system is unique in its segment in Europe for offering not just a short-range radar, but also a longer-range unit which is able to identify cars and pedestrians further away and at higher speeds than many competitors. The short-range ‘City’ radar helps drivers to avoid or mitigate the effects of front collisions when travelling under 50 kph, while the longer-range ‘Urban’ radar enables the Optima to detect and respond to obstacles at speeds between 30 and 80 kph. The AEB system’s pedestrian-detection function is designed to identify pedestrians when travelling up to 60 kph and reduce the risk of a collision. Some of the most important innovations to reduce NVH include a larger under-floor cover and more effective windshield seals, each of which help to reduce wind noise by two per cent while aiding aerodynamics and, ultimately, fuel efficiency. Increased dashboard insulation helps to reduce the level of engine noise in the cabin by around four per cent, aided by general improvements to the acoustic refinement of most engines in the range. Larger cross-member bushings, front and rear, also isolate road noise, while reducing the level of vibration through the floor and steering wheel. The new body, with the increased application of high-strength steel alloys, plays a major part in raising refinement levels. With a more rigid frame and stiffer body panels and engine mounts, the Optima successfully reduces the level of vibration through the cabin. 83 per cent stiffer alloy wheels further cut vibrations resulting from contact with poor road surfaces. In turn, the stiffer body and wheels have enabled Kia engineers to make subtle changes to the car’s suspension geometry to further isolate vibrations and road noise without compromising the car’s dynamic abilities. Improving ride and handling was a top priority for Kia’s dynamic development teams, with a focus on delivering the ride comfort and stability that customers expect from a D-segment saloon, while achieving the level of agility promised by the car’s sportier appearance. With a lighter, stiffer chassis, the suspension is better able to isolate vibrations and bumps from poor road surfaces, while a series of upgrades to the suspension set-up helps to blend agile handling with an improvement in ride comfort. With fully-independent suspension all-round, Kia’s engineers have moved the front and rear subframe mounting points further out towards the edge of the vehicle for a smoother ride over uneven surfaces. The front suspension has been upgraded from two bushing mounts to four to increase lateral stiffness, with more robust wheel bearings completing the front suspension changes. The result is improved responses to steering inputs and greater traction around corners, while further reducing the time it takes for the suspension to settle after a more significant jolt in the road. 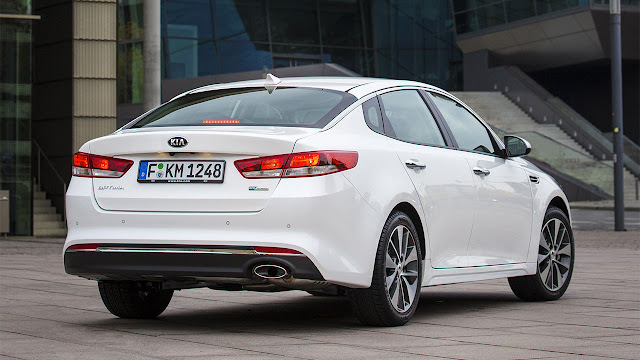 At the rear, the all-new Optima receives larger dual lower arms – the previous generation Optima’s suspension was connected to the chassis with single links on each side – mounted with thicker, more absorbent bushings. Further defining the Optima’s ride and handling characteristics, these changes have helped engineers achieve greater stability for the all-new model, and improved bump absorption. These upgrades are aided in part by the small increase to the all-new Optima’s wheelbase. The all-new Optima is fitted with a new rack-mounted electric motor-driven power steering system (R-MDPS), available as standard for European models fitted with the 1.7-litre CRDi engine. Mounted directly on the steering rack, rather than on the column, the new R-MDPS provides greater steering feel and quicker, more linear responses to driver inputs – particularly around the centre. This upgrade to the steering results in sharper handling characteristics, placing it among the most agile cars in the D-segment. For the all-new Optima, customers can also specify an optional electronic controlled suspension system with internal valves (ECS), to deliver ride and handling tailored exclusively to the tastes of European drivers. ECS employs internal valves for each of the four dampers, and is connected to a G-force sensor in the ECU and two G-force sensors built into the front wheels. Using these sensors, ECS detects steering inputs and accelerator pedal position, and monitors road conditions, to adapt the suspension for a firmer, sportier ride or for greater comfort – drivers can choose from ‘sport’ and ‘normal’ modes accordingly. The system provides individualised damping force for each wheel more quickly than ever before. ECS will be available from launch on models fitted with the 1.7-litre CRDi diesel engine. The all-new Optima debuts a number of new, advanced on-board technologies to improve usability, comfort and convenience. The new technologies featured in the all-new Optima make it the one of the most innovative cars in the D-segment. At the heart of the AVN system is the new Kia Connected Services package, offering a wide range of up-to-date, driver-oriented information. Provided by technology company TomTom, the new connectivity features include live traffic updates, speed camera alerts, local search and weather forecasts. Providing useful real-time information, Kia Connected Services will enhance the safety, comfort and enjoyment of every journey. In Europe, the system will be available to Optima buyers free of charge for seven years after the car’s purchase. The touchscreen infotainment system is paired with a six-speaker audio system as standard. A powerful 590 watt Harman Kardon Premium Sound system, featuring 10 speakers, an external amplifier and Clari-Fi MP3 restoration technology, is also available as an option. This new Harman Kardon surround sound option will allow music lovers to transform the cabin of their all-new Optima into their own personal concert hall. A first for any car in the D-segment, the all-new Optima is available with a new wireless charger for mobile devices, allowing the new model to meet the increasing demand from car buyers – particularly in this class – for new convenience technologies. Located at the base of the central console, the wireless charger lets users charge their phone on the move, without a wire connection. With ‘foreign object detection’, the 5W charging system activates when a compatible device is placed on the pad, and warns car security-conscious owners when they’ve left a phone on the charger as they leave the vehicle. The system displays the phone’s charging condition on the instrument cluster, and features a safety system to prevent overheating while in use. The all-new Optima also features two USB charging points, one in the front and one in the rear, to allow passengers to charge mobile devices, depending on trim level. Depending on market, other new available features will include: 360-degree Around View Monitor, with four cameras helping the driver to manoeuvre when parking by displaying a birds-eye view of the Optima on the touchscreen; Smart Parking Assist System (SPAS), which parks the car automatically in parallel and perpendicular spaces and helps drivers safely leave a parking space; and Dynamic Bending Headlamps, which sweep the road ahead in line with the steering wheel for greater visibility and improved safety at night. The all-new Optima will be available with a range of engines when it goes on sale across Europe in Q4 this year, striking a balance between performance and efficiency. Driving the front wheels, every engine in the range is compliant with the latest Euro 6 emission standard, resulting in cleaner emissions. The all-new Optima is popular among both private and fleet buyers, and the fourth-generation model offers the choice of either a diesel or gasoline engine, each engineered to meet the varying needs of all types of customers. The upgraded 1.7-litre CRDi diesel engine is expected to account for the majority of European sales from launch. Carried over from the existing model, it receives a range of modifications for its application in the all-new Optima, resulting in greater power output and torque, and reduced emissions. Now producing 141 ps (up from 136 ps) and 340 Nm torque (increased from 325 Nm), the upgraded 1.7-litre diesel engine offers an improvement to engine response, low end torque, efficiency and NVH. The upgraded engine boasts far lower CO2 emissions, reduced by 14 per cent to 110 g/km (when fitted with manual transmission and Kia’s Idle Stop/Go fuel-saving technology). A new electronically-controlled variable-geometry turbocharger actuator results in more efficient turbocharging for improved accelerator response and greater low-end torque. Maximum torque is now available from 1,750-2,500 rpm, offering greater drivability over a broader range of engine speeds – peak torque in the outgoing Optima was accessible from 2,000-2,500 rpm. A new piston coating reduces friction throughout the four cylinders, while a new timing chain crank sprocket reduces engine noise, in line with the additional soundproofing throughout the car. The all-new Optima is also available with the same 2.0-litre CVVL engine as the outgoing model, featuring continuously variable valve lift technology for smooth delivery of its 163 ps power output and accelerative response. A wider range of powertrains are currently under development by Kia, which will lead to the 2016 launch of a high-efficiency plug-in hybrid electric Optima, as well as Kia Motors Europe’s first high performance saloon. The all-new Optima features the brand’s advanced new seven-speed double-clutch transmission (DCT), recently launched in the enhanced Kia cee’d and available exclusively on models fitted with the best-selling 1.7-litre CRDi diesel. Kia’s new DCT is capable of handling the higher torque outputs of the turbodiesel engine and has been engineered to offer a sportier driving experience with instant gear changes. Kia’s new DCT has been developed in-house, engineered for low fuel consumption and a sporty driving feel when in manual mode, and with comfort and smoothness when left in automatic mode. Drivers specifying the new DCT will benefit from faster gear changes than a traditional automatic transmission, as well as lower running costs. When equipped with the new DCT, the 1.7-litre CRDi engine sees its CO2 emissions drop to 116 g/km, a 40 g/km improvement over the outgoing Optima fitted with a six-speed automatic transmission. This 25 per cent improvement to the car’s CO2 output ensures best-in-class emissions for a diesel automatic. The 1.7-litre CRDi is also available with a six-speed manual transmission, while the 2.0-litre CVVL engine can be specified with either six-speed manual or automatic transmissions. The all-new Kia Optima will go on sale across Europe in Q4 2015 and from January 2016 in the UK, offering the company’s unique seven-Year, 100,000 mile warranty as standard. 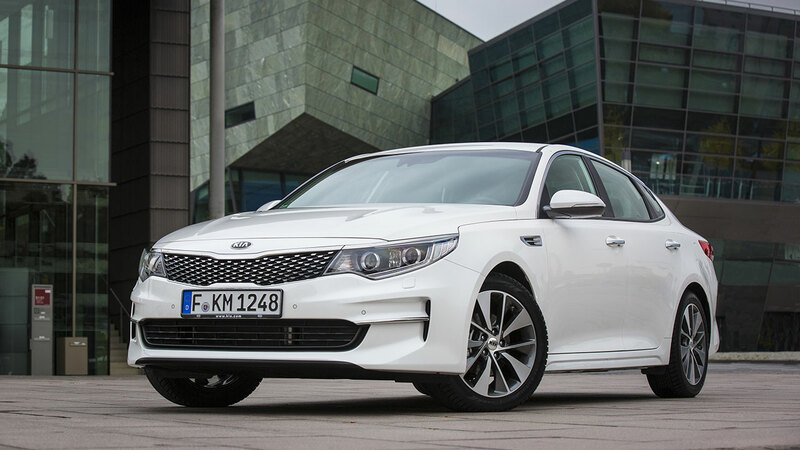 The all-new Optima for Europe will be built at Kia’s plant in Hwasung, Korea.